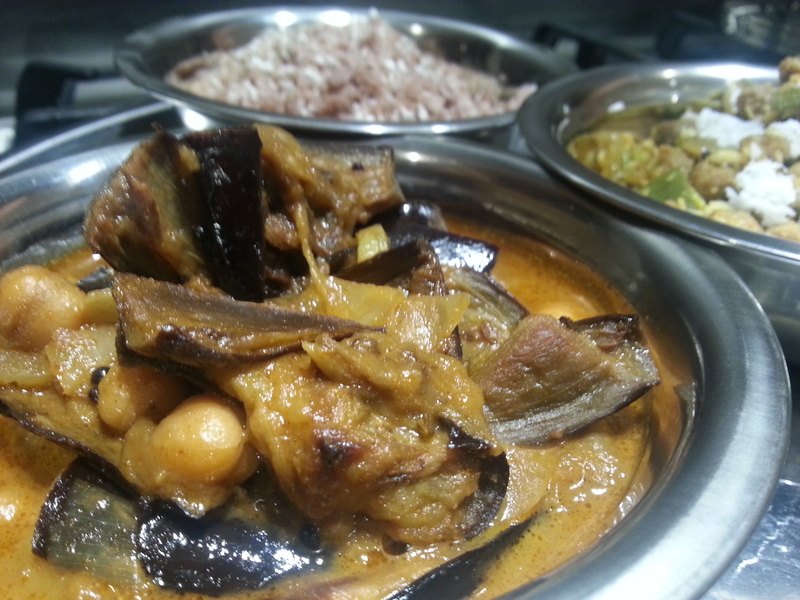 Aubergine, eggplant, baingan, kathrikkai…call it what you will! But this veg. Vegetable? Ahem! Actually it’s a fruit would you believe and is one of my favourites! There’s so many different dishes that I have seen from around the world that use this versatile purple plant so I decided to share some of my recipes with you. In English I use the term ‘Aubergine’ and although in botanical terms is classified as a fruit, it is often thought of as a vegetable and used in mostly savoury dishes. However I have seen it used once as a dessert and I am perfecting this to share with you one day 🙂 So the first recipe I have using aubergine is one which is a fusion from India and Persia and is called “Baingan Borani“. Borani is a term used in Persian cooking for a dish containing a cooked vegetable in a yoghurt gravy. We have a South Indian/Srilankan version which uses Aubergine burnt over a flame and I love the smokiness that this ‘pachadi’ (yoghurt salad) gives. 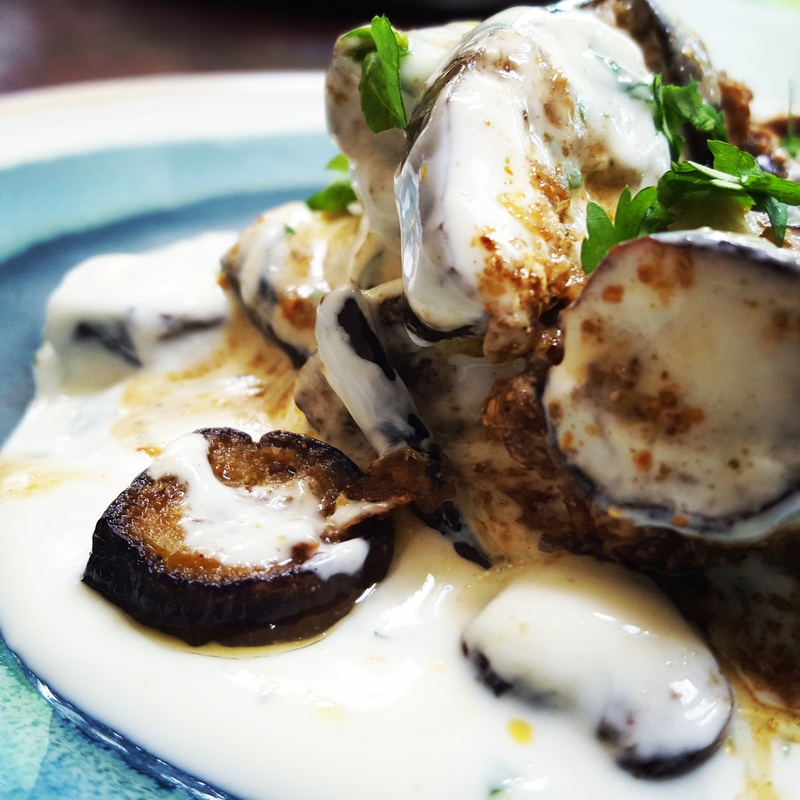 I have also seen very similar yoghurt and aubergine recipes from Greece and Turkey and we couldn’t get enough of it during a trip to Istanbul. Baingan Borani is so flavourful that you don’t really miss the heat that you might usually add into such dishes and so it marries well with spicier side dishes or a spicy biryani or pulao. The next Aubergine dish is a srilankan classic. “Kathrikkai Kuzhambu” is a favourite in many Srilankan households and is so yummy with Srilankan Roti’s, Pittu, Idiyappam or rice. The aubergine is the best product to soak up the spicy tamarind gravy and just melts in your mouth. I personally love this dish a day after it’s been made as the flavour really intensifies after 24 hours, but sometimes I just can’t wait that long! When I was young, it’s one of dishes I used to ask my mum to make after a holiday abroad and it’s definitely a family favourite. I actually don’t know many Srilankans or Indians that don’t like it! The third dish incorporates aubergine in a stunning salad. Spring Salad with aubergine and Quinoa requires some time for preparation but really is a beautiful dish and will have your guests asking for the recipe. This salad is great during hotter months and as it uses Quinoa you veggies out there will be able to get your protein fix too 🙂 Although I have named it as a salad, you could have this as a meal on it’s own as it contains so many different nutrients and so flavourful. 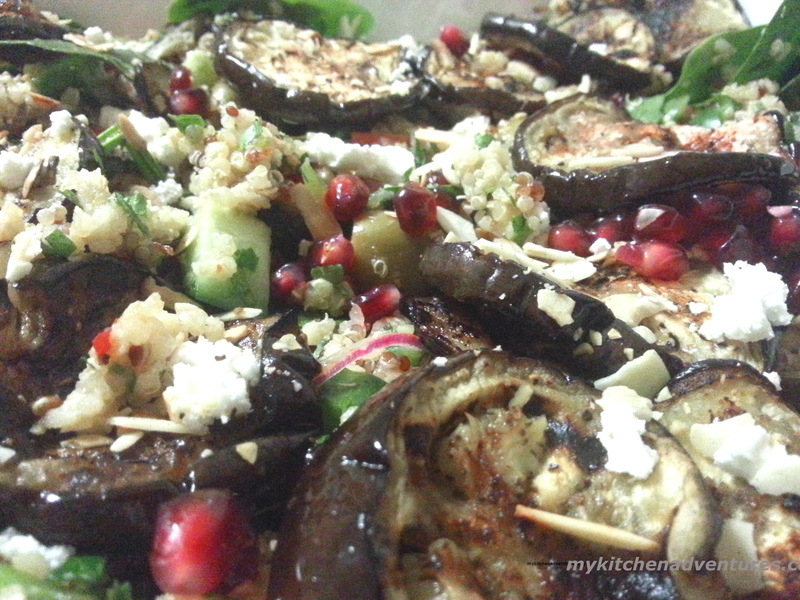 The earthy aubergine hits the tangy feta and the sour and sweet pomegranate and it’s like an explosion in your mouth! 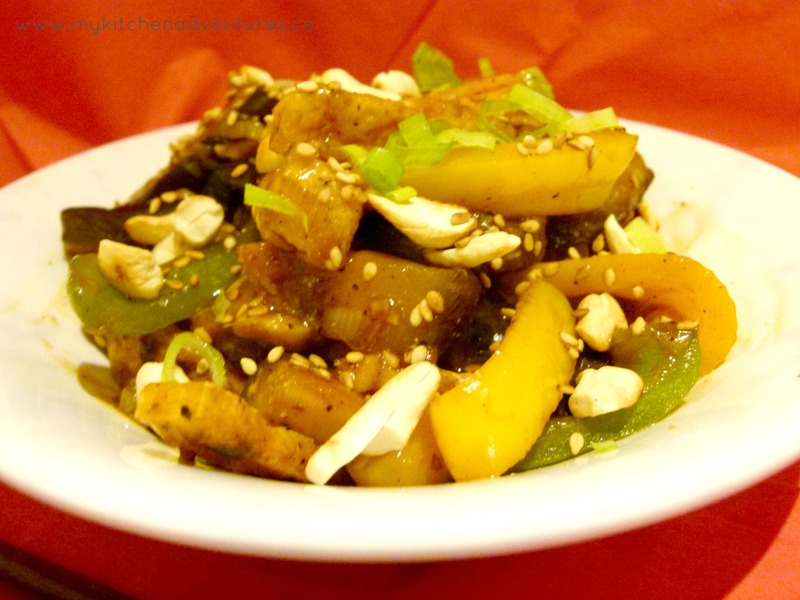 Finally, one of my favourite aubergine dishes from the Orient is Chinese Aubergine Chilli Tofu. This is soooooooooo good with just steaming hot jasmine rice or noodles and I love it especially during the colder times of the year when you just want to have some comfort food. You can make this as spicy as you like and vary some of the vegetables depending on what’s in season. But the base should be kept with Aubergine and Tofu as the texture of these two ingredients I think are really important in this recipe. Oh gosh, I’m salivating just at the thought of this dish! There’s nothing quite like a cup of freshly brewed coffee in the morning. 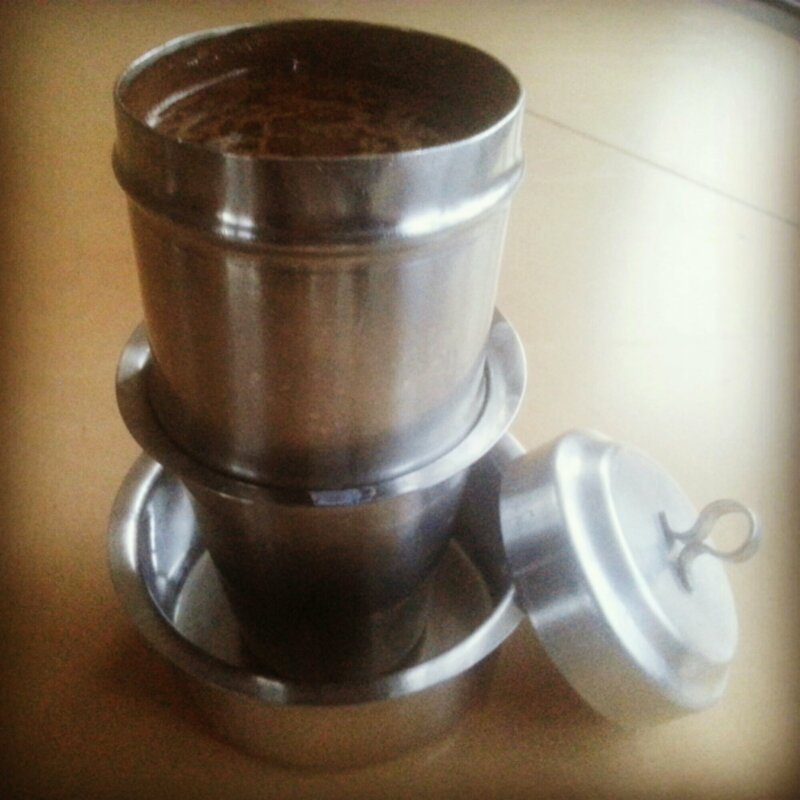 But South Indian filter coffee is the King in my books! The nectar to start a fab new day!